Gingivitis is characterized by a condition in which there is a mild form of gum disease which causes redness, irritation and inflammation (swelling) of the gums. Because this condition can be mild, you might not know that you are experiencing the condition. But it is very important to take it seriously and seek proper dental care to treat this condition. Gingivitis, if left untreated, can result in more serious gum infection (periodontitis), which might lead to tooth loss. Poor dental hygiene is one of the major causes of this problem. Proper dental health habits, like brushing and flossing the teeth every day and regular professional dental check-ups can help keep the condition at bay. this problem is a very common condition. 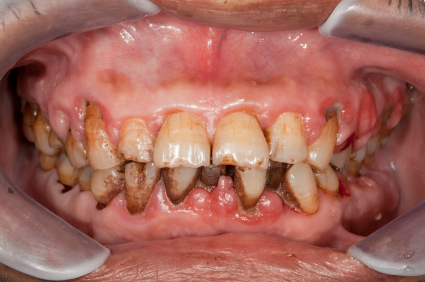 Factors that increase your chances of developing gingivitis include tobacco use, poor dental health habits, older age, dry mouth, poor nutrition, certain fungal and viral infections, diabetes, certain medications, decreased immunity, hormonal changes, ill-fitting dental restorations and substance abuse. It is important that you visit a professional dentist at Brighton Implant Clinic on a regular basis for the evaluation and treatment of this problem, cavities as well as other oral health conditions. Schedule an appointment with a dentist immediately if you experience any symptoms of gingivitis.